Got some questions about our belly dance costumes from dancers who wonder about our collection. I myself usually wear higher quality costumes with a higher price tag and that category will be in the bazaar. But consciously, I have chosen to include the categories I call “Student costume” and “Semi pro costume” because the idea of ​​the shop is that we want to spread oriental dance and be an asset for ALL dancers, not just professional dancers who have a high budget to spend on a belly dance costume. We also want the student who performs for the first time to be able to find a belly costume in our collection. We sell belly dance costumes for student shows at budget prices and designer belly dance costumes for professional performances. The idea is that with us all belly dancers should be able to find the right belly dance costume. We sell both used and new belly dance costumes. In our collection there are costumes at a low budget price (usually from Asia) that works well for student shows & Haflas. We also sell professional belly dance costumes from Turkey, Egypt, Russia, etc. for those who want finer materials and higher quality. A professional belly dance costume usually costs between 3000-9000kr with a designer. As with all other fashion, it is the material, quality and design that makes the price tag. 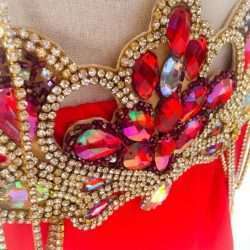 A designer belly dance costume usually have sewn on AB crystals, lots of handwork, strong stitches and are made of durable material that can handle sweat and movement of the body. We also describe the material so you can decide what kind of belly dance costume that suits you best. Do you want to order another size or color? Or are you a dance group who wants to order more belly dance costumes than we have in stock? Contact us with the image of the belly dance costume and describe what you want. Many of our suppliers can make custom orders.